Our courier service is based on providing quotes at the best rate given to us. 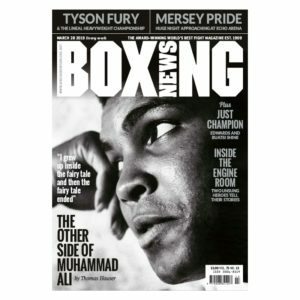 The Boxing News Shop will be unable to refund or replace any orders that have been made if they have not been shipped via a signed for courier service. This is a service that we highly recommend, especially with those orders made outside of the UK, as it is the most reliable, safest and traceable method of delivery. If you chose not to use this service, items will be sent out via a standard delivery and will not be eligible for a refund or be replaced should items be lost in transit, after the delivery dispatched email is received. It takes longer to deliver to certain areas of the World All orders placed on the Boxing News Shop - unless otherwise specified - are dispatched via a standard mail delivery service from the UK. The orders are only processed weekly so we are unable to guarantee delivery requests. Please be aware that due to increased international security, especially in parts of the USA, some items may take up to 60 days to deliver from our dispatch date. This is another reason to why we would recommend the tracked courier service, so that you can monitor the progress of your order, and also have the peace of mind that even if customs confiscate the item, we would then be able to send a replacement. Damages Please inspect the packaging of your item(s) when they arrive, if you notice any damage you should make note of it. If you item(s) do arrived damaged please contact us. - The period stated within which you will receive your order is approximate. Goods will be sent to the address given by you in your order and stated in the Order Confirmation. Please be careful when typing your address, as we cannot be held liable for any mistakes made by you, resulting in the loss of your item. - Please note that your goods may be sent to you in instalments. - If your delivery address is outside of Jersey, you may be subject to import duties and taxes, which are levied once a shipment reaches your country. Any such additional charges for customs clearance must be borne by you. You should note that customs policies vary widely from country to country; the Boxing News Shop advises each customer to contact their local customs office for further information. - Please note that when shipping products internationally, you should be aware that cross-border shipments are subject to opening and inspection by customs authorities. - For Christmas Deliveries, we recommend that you order by the 16th December. We will endeavour to dispatch all ‘in stock’ orders within 24 hours, however we cannot guarantee delivery on or before the 24th December as the post may be delayed in your area. - You may return any unopened items within 7 days of receiving it, for a full refund. We will refund your card once we have received and processed the item. - Please keep proof of returns (Postal Receipts) as if items are lost in transit and postal proof isn’t provided, we will not be obliged to process the refund. - We have a general 3 month cut off date for dealing with any un-received items and refund queries from the moment you receive your ‘item has been dispatched email’. After this date, we will not be obliged to fulfil any refunds, replacements or exchanges if we have not been contacted before this date. - Unfortunately we are unable to refund CD’s or DVD’s unless faulty, which will be tested on arrival. - In special cases it is in the discretion of Boxing News to offer gift cards or discounts off your next order, should a refund be unable to be processed. - We will only refund delivery costs if the return is a result of our error. - We cannot refund or exchange an opened item unless it is faulty, or if the item was sent to you through our error. - To arrange the refund or replacement item please email services@boxingnewsshop.com. Please package item(s) carefully with your purchase order number, Name and full Address. If items are returned damaged, we will then have the optional choice of deducting 15% from your refund. - Refunds will only be issued to the original credit card that you use when placing your order. - Discounted items can be returned to us if they are unwanted, incorrect, faulty or arrive in a damaged state. We are able to offer you a replacement only for any discounted Multi buy items. - Main or qualifying Multi buy items can be returned to us if they are incorrect, faulty or arrive in a damaged state. We are able to offer you a replacement for any qualifying Multi buy item. - Due to the nature of these promotions we cannot offer you a refund for the main or qualifying item alone. - All orders cancelled after 48 hours are subject to an administration fee whether or not your order has shipped. If you order has shipped, you (the buyer) will also be responsible for the return shipping charges.